So, I didn't get as far as I thought I would on my Maplewing Shawl while I was traveling. It turns out that there is something that I'd much rather do than knit: hang out with my family! Who would have thought? 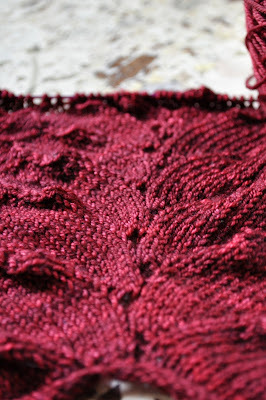 I'm almost to the end of the bottom lace section, however I'm thinking I might add another repeat (or four) to make the shawl a little bit longer. Even though I'm making the tall size, I'm still worried that it will be too small. Although Anne Hanson, the shawl designer, is modeling the petite size in this photo, I'm fairly certain from other photos on her blog that she is pretty petite as well. So, I'm thinking that even though the tall size is bigger than what is shown in that photo, I don't know if it will be big enough. I'd rather knit it a little bit bigger and not take my chances that I'll end up with a neckerchief instead of a shawl. I am, however, a bit concerned as to how those extra repeats will play out. I think I have a picture in my brain of the concept of the shawl and I'm thinking that a few more rows won't do any harm. I guess we'll see. I'd hate to rip back all those rows of tiny stitches, but if it isn't right then the tiny perfectionist inside of my brain will bug me until I do. But I have a hunch it will turn okay after some intense blocking. As for the particulars, I am LOVING the Malabrigo Sock for this project. It is just the right amount of softness and durability. 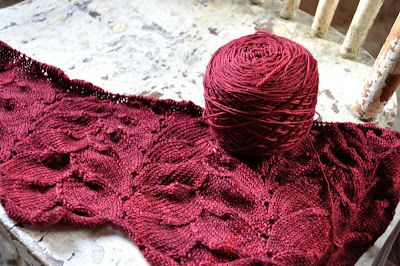 I have had recurring daymares about knitting a lace shawl with true lace yarn and then snagging it on a doorway or other object (because, let's be honest, I'm pretty klutzy like that) and crying my eyes out for days at the destruction of such a precious piece. But I don't get that paranoia with the Mal Sock, so let's all keep our fingers crossed that it holds up to regular wear. And I can't say enough about the pattern itself. Anne Hansen does an amazing job of laying everything out in such a logical order, so it makes even the more difficult projects easy to understand and accomplish. It's written out line by line as well as charted, so you can take your pick of how you'd like to go about it. Here's a couple shots of the stitch work. I can't wait to block it and open up the lace a little, although I am rather liking the way it is right now as well...all dense and squishy. I will hopefully be getting some more time work on it as I will be traveling again here shortly. I'm headed to Reno for a conference for about a week and then to Seattle to visit some friends for a couple days. Of course I have already scoped out all of the local yarn store locations in both cities! 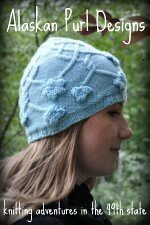 I had no idea that Jimmy Beans Wool was located in Reno...and it's right down the street...so I just wouldn't feel right if I went all that way and didn't go visit...right? I thought so. Anne's patterns are great aren't they... good luck with your mods they sound like they'll work well. 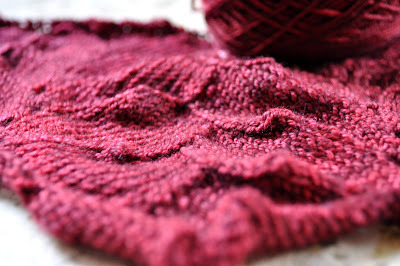 Your yarn is beautiful, perfect colour for a Maplewing shawl. I guess that the blocked measurements would be a good thing to look at, wouldn't it?! And I'm the same way about Ravelry...it's become such an important part of my process.